...not just a hard drive crash but a crash that would drive them to a disaster and make their lives go -- KABOOM!!!... all hell breaks loose when - the game that was meant to be played with... starts playing them... Ra.one- The next level. 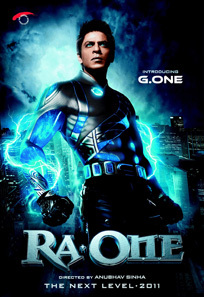 Shah Rukh Khan G.One in RA.ONE, a film directed by Anubhav Sinha. Picture courtesy Red Chillies Entertainment. All rights reserved.